But that’s not Bernie Sanders in the photo. It is Bruce Rappaport. Classmates of the two men started raising concerns about the discrepancy last year. 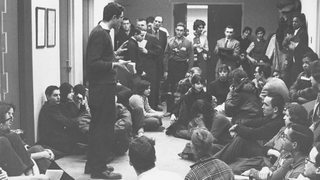 According to Time, four University of Chicago alumni told the magazine in November that they believed the man to be Rappaport, also a student activist, who died in 2006. 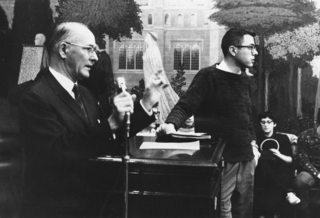 At the time of the story, the photo was still captioned as Bernie Sanders in the University of Chicago’s photo archive. But the picture’s caption has since been changed. “Alumni who knew them well said that was Bruce Rappaport [pictured],” a University of Chicago official told me Wednesday. The caption was changed in January. “This was just a case of honest misattribution,” the official told me. I’m a hundred percent sure that Danny is wrong. So who is truly the person featured in the above photos? The man who took the photos, Danny Lyon, has come forward and identified the photos as taken by him and being of Sanders. He was the campus photographer who documented the events for publication, not just some guy who took a few photos. He has the contact sheets - prints made directly from the roll of film he exposed. So [the contact sheets] are in chronological order, like dominoes that you cannot move, 1 to 36. In other words, Bernie standing talking is number like 7, 8 and 9. Bernie sitting down is number 10. And those three close-ups are 11, 12 and 13. They are on the same roll of film in sequence, shot in that room on that day by me. This link is not in itself a reliable source, but it cites reliable sources. And quotes the photographer. The only evidence on the other side is a bunch of people saying "it doesn't look like him". Eyewitnesses are notoriously bad at identifying people in the present, let alone people from forty years ago - even if that person is an ex-husband. The University of Chicago, which initially changed the caption to Rappaport, has now changed it back to Sanders in response to Lyon's evidence. Even if by some bizarre chance it turns out that the photo is of someone else, it is irrelevant - a fact that is made clear even by the people who believe the photo is of Rappaport. We know from multiple testimonies that Sanders was at the same place, at the same time, doing the same thing (i.e. fighting for civil rights) that the photo depicts. Not the answer you're looking for? Browse other questions tagged united-states history politics . Does the U.S. Commission on Civil Rights consider Christians a hate group “threat”? Did the DNC try to prevent Bernie Sanders from getting the Democratic nomination? Are these photos of burned home surrounded by pristine trees in California due to the forest fires real?